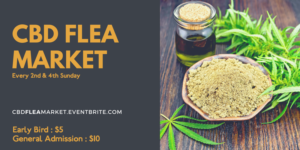 We invite you to join us for District Hemp’s very own CBD FLEA MARKET, featuring the leading CBD brands in the DMV! Our event caters to those who seek pain relief without the associated psychoactive effects of cannabis. Whether you’re a novice to cannabidiols, or an enthusiast wanting premium products, we are here to service your needs. Join us to enjoy CDB at its finest!